I’ve never tried drying… I might though. We have a large pepper crop and the apple trees are full. 🙂 So I might give it a go. That does sound interesting… Hope the courgettes re-hydrate well. I’ve dried bananas before. They get intensely sweet and slightly chewy; it was a bit much! I prefer roasting my peppers and bottling them in olive oil. I’ve considered preserving peppers that way but there are dire warnings on the internet about the high risk of botulism, which has always put me off! Advice on how you do yours – for example do you heat the oil and bottle them hot? what size jars do you use? etc – would be most welcome. I roast and skin them first. Then into the Ball jar, fairly tightly packed, and hot olive oil poured around them. Then I pressure cook them for a bit. Don’t use recycled jam jars, they don’t seal properly and the glass isn’t strong enough to withstand the heat and pressure. With Ball jars, you replace the seal top each time, but reuse the jar and the screw down ring. I can send more detailed info if you’re interested? Now I’ve stopped dashing about so much, we should Skype. Let me know when’s convenient. I have to see the Husband off to work at 7am-ish, or 10pm your time. Free after that – would that work for you? I’ll be here trying to get Skype to behave! Weve dehydrated mushrooms, which were fine. I actually cant remember what we did with them after! We have done chillies, just when doing other things, rather than air-drying them. Sometimes they get chopped up to make chilli flakes. Ive done spring onion (I think they may be called something different where you are, the long green shoot onions!) chopped into bits. So good rehydrated in a meal when you can’t be bothered chopping up an onion. And also tomato. We rinse them in vinegar and put them in olive oil with some chilli and garlic. Strong but yum. They do well with cheese and biscuits. I’ve done chillis before too, but I hadn’t thought of spring onions (yes that’s what we call them)… and your tomatoes sound fantastic. 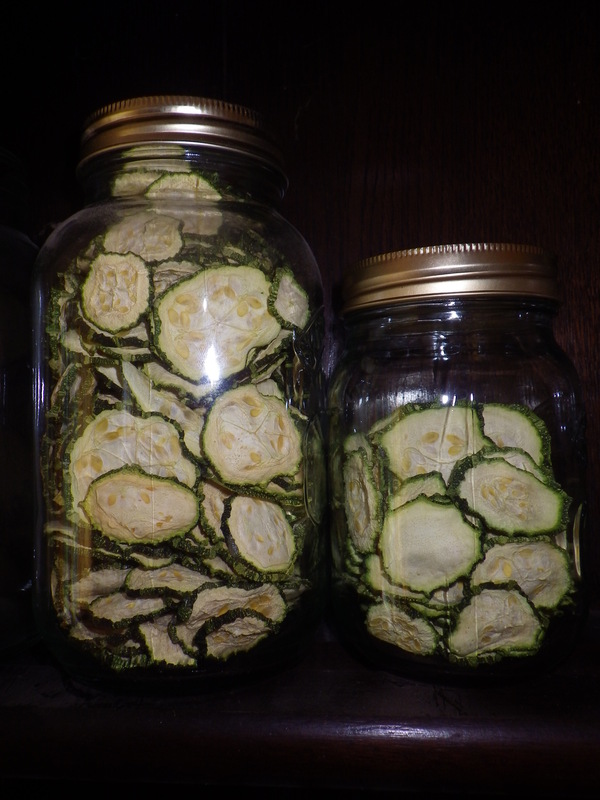 Are the dried courgettes crunchy or chewy? I’m always on the look out for home-made, packaging free savoury (ie crunchy) nibbles. They are crunchy, so would make an ideal snack if you like the taste. I’ve dried several foods for backpacking meals. They’re especially delicious after hauling them up and down mountains! And I look upon your bounty with admiration! We ate our garden’s first two zucchini just yesterday. I find that food always tastes different after being lugged around in a rucksack! Many years of field work as an ecologist taught me what I like and what I don’t that comes out of a flask or lunch box. However, that was always pre-prepared; I’m sure a meal cooked from ingredients you carried on your back all day is a whole different experience. The environment contributes, certainly (no surprise)! I do now have crispy pieces of courgette and have high hopes for future soupy goodness! You are right – space is at a premium and, whilst I like ready made soup in the freezer, there is only so much space to store it.